Hakama refers to the traditional black pleated trousers from Japan still used in some martial arts, such as aikido and many sword styles. According to Sakamoto-Sensei, these other Japanese martial arts (hakama aren’t often worn in karate) have a hip technique associated with garment. This hip technique was also used in the technique of Chito-Ryu founder Tsuyoshi Chitose (according to pictures of the master’s technique that Sakamoto-Sensei showed us) and in the technique of Shinzato-Sensei. The technique is combined with shime-goshi and involves the tail bone and pelvic region dropping back and up (their natural position in shiko-dachi, for example). The hip action can add a lot of power to techniques but must be accompanied by a complete relaxation of body and sinking weight. To demonstrate the effectiveness of hakama-goshi, Sakamoto-Sensei showed us a number of techniques. For example, if you take the opening block of Niseishi kata, or the raised hands of tai chi, and have a partner hold down your wrists, it is very difficult to raise your hands without using a lot of strength. With a soft body, Sakamoto-Sensei dropped his weight and let his pelvis drop back, and easily lifted his hands despite the best efforts of his partner. 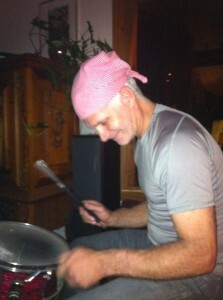 And he did this without using much apparent physical strength. He demonstrated, and had us practise, a number of techniques in this vein. I noted with surprise that many of the same principles, and even exercises, exist in a form of tai chi I have begun to study. In both Ryusei karate and in martial forms of tai chi (i.e., not the ones solely focused on health benefits), using the body as an integrated whole, as a whip, without relying on a lot of muscular tension, is the goal. A dropping weight, a softness of body that flows from the softness of mind, and the proper use of hips are among the key elements. 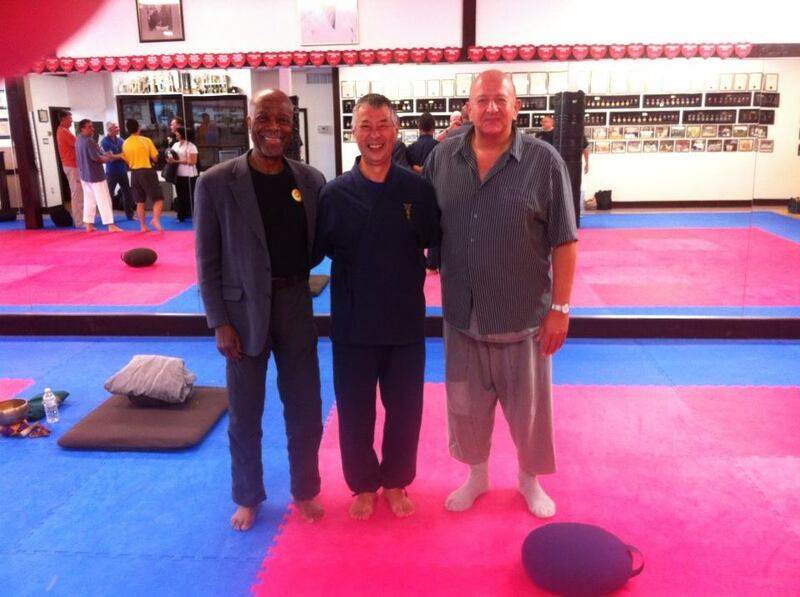 Three Ways to Emptiness seminar leaders: Rodney John, Ken Sakamoto and Jacques Oulé. 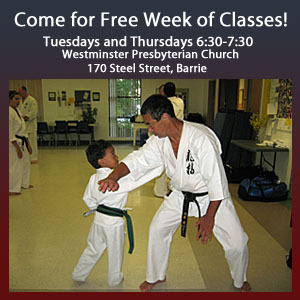 The first clinic was open to anyone with a Chito-Ryu background and was held at Jennings School of Karate, in Bradford, Ontario. The Three Ways to Emptiness clinic featured three different instructors. First, Jacques Oulé, a Buddhist dharma teacher, led the group in a Zen meditation session, showing how to train the mind and spirit to tap into the power of great calm. Next Rodney John, a tai chi teacher of 30 years experience, demonstrated practical applications of his art, revealing the power that lies at the core of softness. Finally Sakamoto-Sensei finished the day concentrating on hakama-goshi, showing how the lessons of the previous two teachers can come together in karate technique. 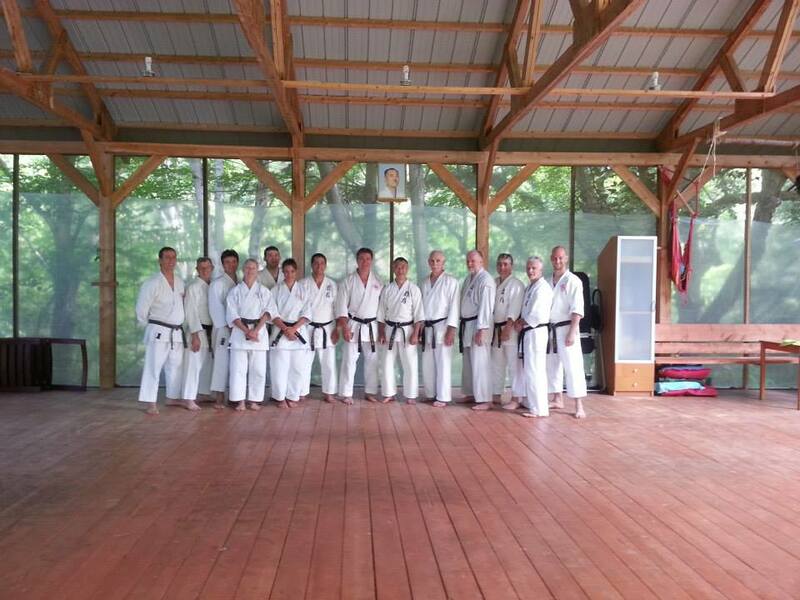 As the week went on, Sakamoto-Sensei taught a Ryusei instructors clinic, clinics for Ryusei members at the Hanover and Barrie dojo, and did some private training with instructors, including Peter Zehr and Matt Mannerow. Besides his hakama-goshi technique, Sakamoto-Sensei taught his new version of Sanchin, which combines the original Sanchin with Tensho. In private sessions he also went through Unsu and the first 10 movements of Nage-no-Kata, a much more powerful and dangerous form of the bunkai than is generally known in Chito-Ryu dojo (Sakamoto-Sensei insists that this is the version of the bunkai that he learned directly from O-Sensei). We finished the series of clinics with the Ryusei Ottawa Summer Camp, held on the outdoor platform built by Rick Going on his beautiful property in the hills of Quebec. We were joined by Terry Valentino and his students from the Koshin-Ha Chito-Ryu in Pittsburgh, and James Acampora and his wife, Rose. James runs a Chito-Ryu dojo in Orlando, Florida. Besides hakama-goshi, we also reviewed Sakamoto-Sensei’s approach to the Niseishi bunkai and some of the Henshuho bunkai. 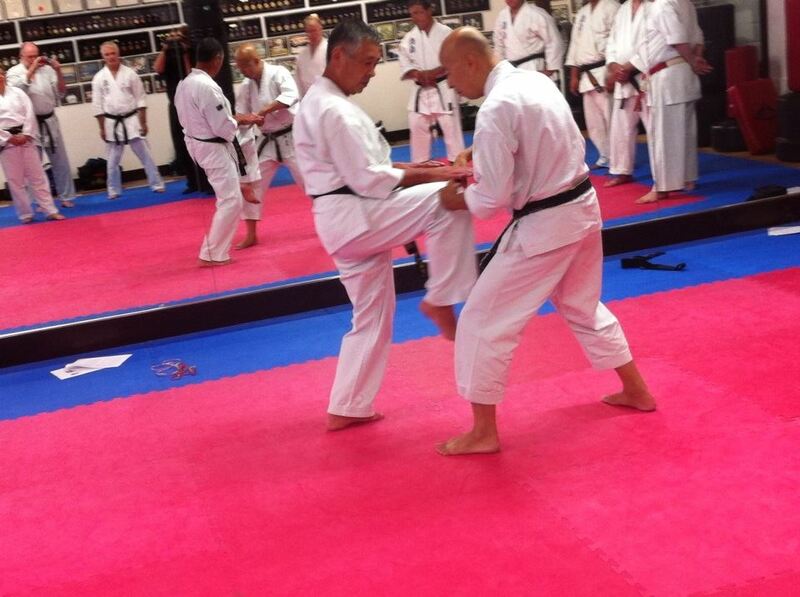 On the Sunday morning, the Canadian Ryusei instructors demonstrated the kata they have been working on, showing Sakamoto-Sensei that they are trying hard to understand his approach to Chito-Ryu technique. With the beautiful location, and the fine hospitality of Ottawa instructors Rick Going and Kambiz Miranbigi, the summer camp was a great finale. Days of hard work were followed by evenings of fine food, drink, music and bonfires. At the end of the clinics, we were all left tired but exhilarated by what we had learned. Thank you, Sakamoto-Sensei, for you thoughtful instruction and painful demonstrations. Thank you to the Canadian instructors – Peter, Matt, Kam and Rick – for your support and hard work that made things happen. And thank you everyone who attended the clinics.